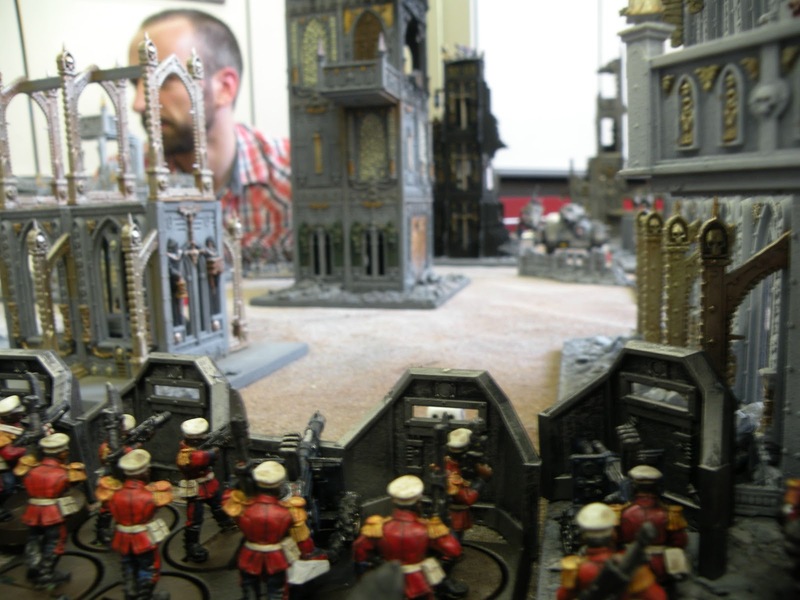 A few weeks ago I played a large game of 40k at my local club, Murphy's Heroes. The game was a 2000 point, guard vs guard battle royale, on a cityfight table. We had 4 objectives; three statues (Yarrick, Dante and the Last Stand at Macragge) and a tomb along the middle of the board. 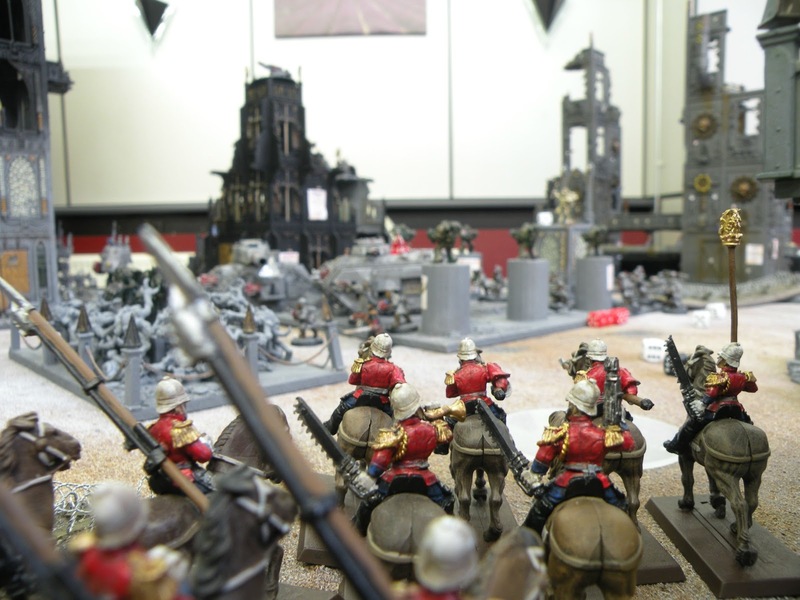 My army consisted out of my Hollan infantry company(see the post below), bolstered by a squad of grenadier veterans, two squads of penaltroopers and an Aegis Defence Line. I lined up my defence line a few inches away from two objectives (the tomb and Yarrick's monument). With both 2nd and 3rd platoons behind the line, and first platoon in a ruined manufactorum behind them. 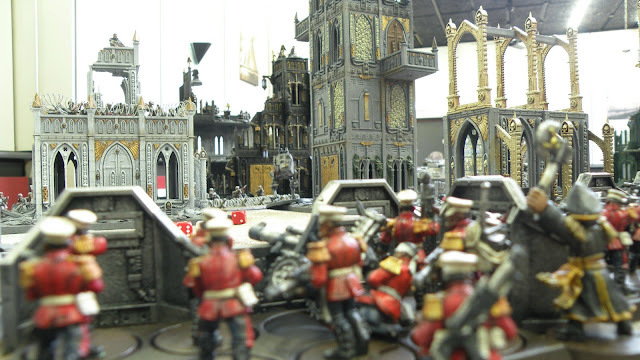 The ratlings infiltrated in a large chapel ruin on the right flank, with the psykers in support. 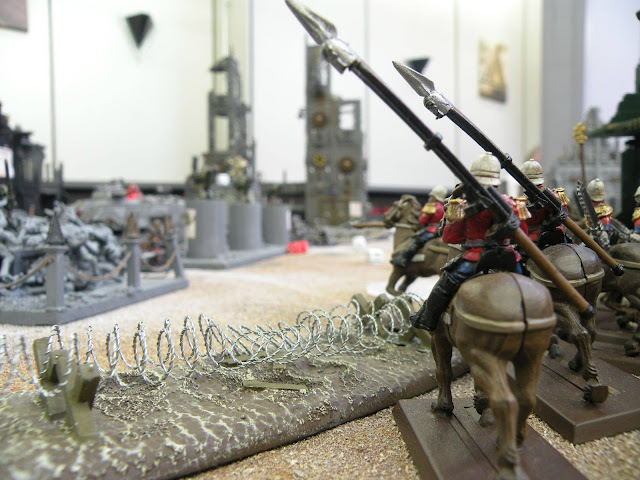 the sentinels and penal legions outflanked, the veterans and roughriders stayed in reserve. Eric concealed most of his units in the ruins, taking advantage of their warlord trait. He concentrated his units on my right flank because he realised that trying to take the two objectives just inches form my defence line would be suicide. Because of the rather long time it took to move and shoot with so many units on the table, we only managed to play 3 turns. The first turn was marked by some abysmal dice roling on both sides, resulting in most of my units having gone to ground, and Eric losing both his penal legionaries to a series of abysmal leadership tests and his demolisher to a lucky lascannon salvo (got to love orders...), giving me First Blood. 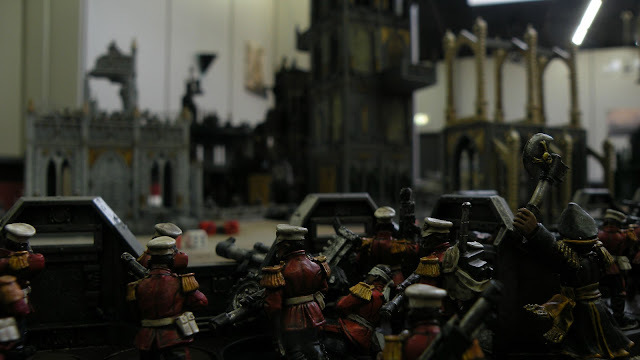 In the subsequent two turns my left flank spend their time slowly being blasted to bits behind their defence line, making good use of the gone to ground rule and the 'get back into the fight' order. Eric in the mean time made his way to the first objective on his side (Dante) and advanced upon the second objective located on my left flank. Luckily for me most of my reserves turned up on the 2nd turn and started to advance upon the last objective at full trot. The cavalry advancing upon the battle of macgrage monument (left) with Dante's collumns behind. This game showed that 40k is quite a reasonable game system if you're fighting with two non-fearless, non 3+ save elite armies. When fighting guard vs guard all the aspects of the game matter: cover matters, leadership matters, movement and assault matters, vehicles matter; every unit can contribute. 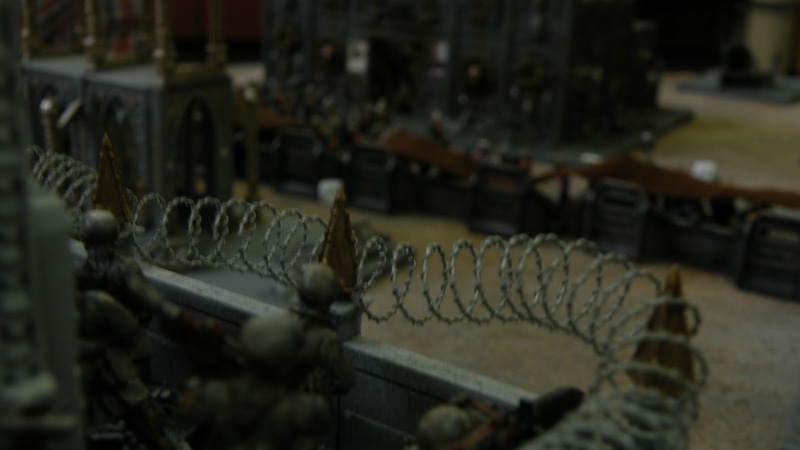 Barrage weapons actually cause pinning and orders make all the difference. Only problem is that a turn takes forever with close to 300 infantry and half a dozen vehicles on the board.